A flexible shaft rotary tool is an essential item for any repair shop. We chose Foredom for their impeccable quality and versatility. The hanging style SR series from Foredom has a 1/6 HP motor, that runs in forward or reverse rotation with a maximum speed of 18,000 RPM. It comes equipped with the standard 39" long key tip inner shaft and outer sheath for connecting to any of Foredom’s hand pieces. We chose this motor as it has plenty of power for working on all types of materials without stalling or slowing down under normal use. The H.30 hand piece is extremely versatile and features a geared 3-jaw #0 chuck that fits any size mandrel or drill bit up to 5/32" (4mm) in diameter. It also comes with a HPCK-0 Chuck Key in molded plastic handle for changing accessories. Note: These speed controls have two power cords that come off the back, the shorter cord accepts the motor plug, and the longer (6 foot) cord connects to a power outlet. 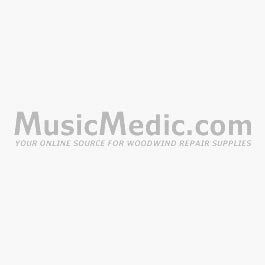 We found these Foredom products to be the most versatile for woodwind repair. However, as a Foredom dealer we can special order any item you may require from the Foredom catalog. Please note all items are sold separately. When ordering choose your motor voltage/country plug type. Add your speed control to the order and it will come in the same voltage and plug type as your motor.